In September 2008, the bankruptcy of Lehman Brothers triggered the worst economic slump since the global economic crisis in the 1930s. Both crises were triggered by the bursting of a speculative bubble and the associated stock market crash. Unfortunately, the basic conditions for such a crash are once again in place. Learn in this post which factors lead to an economic crisis. Economic crises are defined as sharp declines in production and employment, i.e. a decline in real gross domestic product (GDP) and an increase in unemployment. The abrupt and massive decline in GDP often follows a phase of strong economic recovery. This upswing is generally the result of exaggerated optimism about the future and high liquidity. In short, an economic crisis is the result of a burst speculative bubble. The causes of this bubble can be very different: revolutionary innovations, real estate, equities, currencies of emerging economies, government bonds or precious metals. In the first documented bubble – the Dutch Tulip Mania (1634 to 1637) – tulip bulbs were the object of speculation and the cause of the ensuing crisis. No matter what the object of speculation is: It is crucial that a critical number of investors believe that the purchase of a certain asset is worthwhile because over time there will be higher price that will result in an increase in the wealth of the investor. In addition to these optimistic expectations, high liquidity is required. Liquidity can have different sources: an expansionary monetary policy by central banks, money supply through the system of commercial banks or permanent current account surpluses leading to corresponding currency reserves in the surplus countries. The only decisive factor is that the liquidity increases provide the monetary basis for a speculative bubble. However, an endless rise in price rise is impossible. At some point investors no longer believe in further price increases. They sell the assets for which there are no more buyers. The result is a rapid fall in prices, i.e. the speculative bubble bursts. The bursting of a speculative bubble is linked to a loss of wealth among those who own the object of the speculative bubble. and the consumption by them decreases. 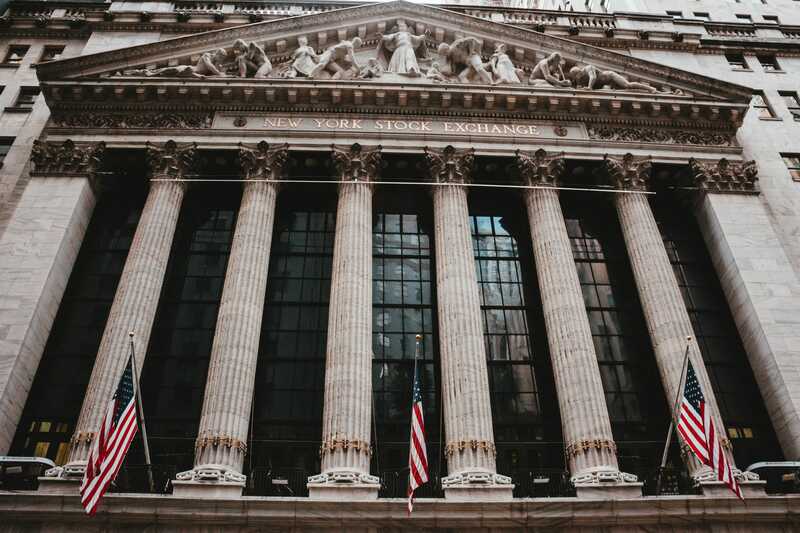 That declining consumer demand reduces the sales and profit prospects of companies in the consumer goods sector, causing their stock prices to fall, leading to a further loss of wealth and reduction in consumption. The general slump in stock prices causes a general crisis of confidence. The increasing uncertainty leads many consumers to save more for an uncertain future (saving for fear). This reduces consumer demand further. The crisis of confidence also affects confidence in the security of savings deposits. Customers withdraw their savings deposits and thus reduce the banks’ financing capabilities. Overall, credit lending declines because banks no longer trust that their loans will be repaid in the future. The crisis of confidence causes a decline in expected returns on upcoming investment projects. As a result, demand for machinery and production equipment falls. The decreasing willingness to provide loans reduces the supply of loans to the economy as a whole, so interest rates rise. Rising interest rates push down investment. The diminishing demand for capital goods reduces the sales and profit prospects of companies in the capital goods sector, limiting production and employment there. The general decline in demand for goods reduces overall economic production and GDP. This is accompanied by an increase in unemployment. As a result, income falls and consumer demand shrinks. In addition, investment declines because it is not worth expanding production capacities. The rise in unemployment causes the government to spend more money on social security. At the same time, tax and social contribution collection falls due to declining employment leading to a decline in government demand for goods. 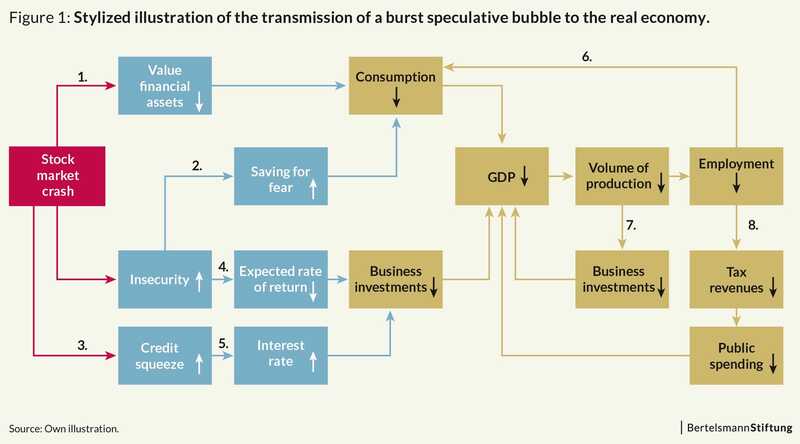 As a result, the asset losses resulting from the bursting of a speculative bubble cause an economic downturn and an increase in unemployment (see Figure 1). Come back next week to read the second part of our analysis. If you liked this post you might also enjoy reading our post on the Greek Economy. Ten Years After - Where Is the Greek Economy?